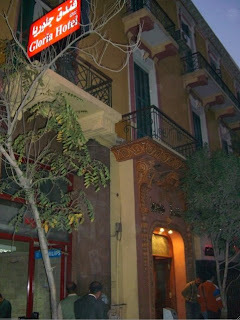 I was surprised at first when the boys told me they were changing hotels in Cairo. They said where they were staying was bad. I asked, "How bad?" They replied, "Real bad." I was surprised at this because you could find the hotel on the internet. People had made comments about the place that were not flattering, but at least they were not so blatantly incriminating as to suggest not to use it at all. I told them I did not care where we stayed, just as long as I knew where it was before I left New York. I had to have an address of some kind. So then they moved to the Gloria. find the Gloria hotel at all, How can it be better?" "Trust us, its better." So I wrote down the name and address on a pad and when I got a cab at the Cairo airport nobody blinked. When the driver and I got to the street however, he turned to me and asked where it was, I told him, "Number 26." stopped at a corner and asked some people. They looked puzzled. We drove on. The driver looking up, me looking up with jet lagged eyes and doubts creeping into my tired brain. We stopped a second time and the same results. This time though a man who had leaned in said he would go and find out. We sat and waited. He came back and said, "It is on the next block." We drove on. The driver looked and I looked and we both could not see it, and then, I spot it. A small sign hanging over the road. The driver asked for a tip. It did not occur to me to disagree with him. The greeting inside was memorable. This humble little hotel had two good friends waiting for me. They asked what I thought. Knowing it was not like the 4 star charm I have been accustomed to. I surveyed the room and its limited attractions. I wondered at who stayed in a place like this and how there could be anything worse. The boys said that it least it had a tv here. I don't think we ever turned it on. skill and accommodating friends. We worked it out. And later over a meal, things were starting to look like they would work out just fine.